When the Republic of Ireland goes on the road for their UEFA World Cup qualifying, this is the shirt – sans EIRCOM - they’ll be sporting. Beginning with their match against Italy in World Cup 2010 qualifier in Bari on April 1st, 2009. 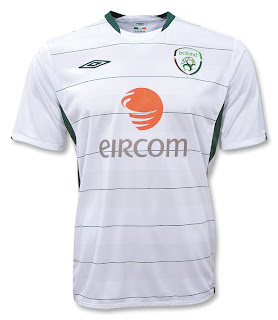 Interestingly, Ireland is the only national team, that we know of, which has a shirt sponsor – I had to google EIRCOM – Ireland’s leading broadband and content provider: http://www.eircom.net/. However, per terms of a sponsorship agreement, shirts worn by the players do not.